Have you noticed that the leaves are starting to fall and the temperatures are cooling down? The fall season is fast approaching and this time of year it's great to take a drive along some of Greene County's country roads. Did you know numerous covered bridges once dotted the County's landscape? 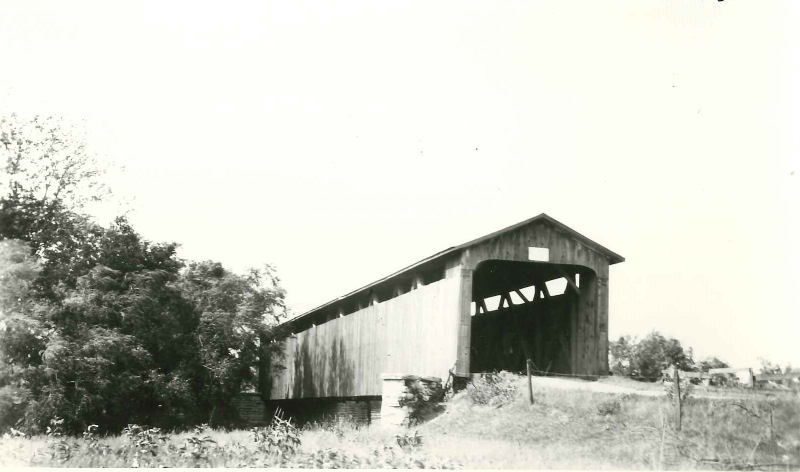 According to James Shell, author of Covered Wooden Truss Bridges of Greene County, Ohio, "covered bridges played an important role in the development of the transportation system in Ohio. Photo to the right is part of Greene County Records Center & Archives Covered Bridge Photo Collection. 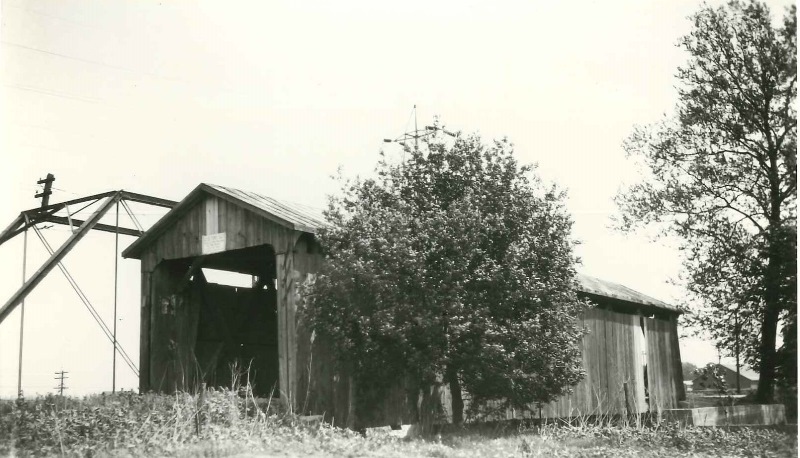 Shakertown Road Covered Bridge was located in Beavercreek Township and was constructed over Beaver Creek by the Smith Bridge Company utilizing a Smith Truss. It was removed in 1955 when US 35 was relocated. All throughout Greene County, numerous wooden truss bridges carried the burden of traffic over the County's creeks and rivers." Using HistoryPin (a website that allows users to upload historical photos, videos and audio recordings. Users are able to use the location and date of their content to "pin" it to Google Maps), we have "pinned" several photographs of the bridges that graced Greene County's countryside. 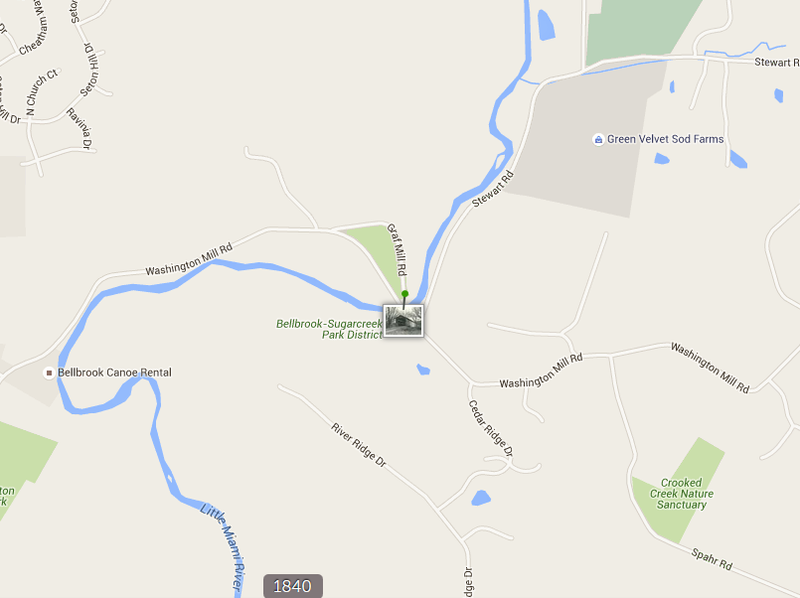 Below is a Google Map Image of where the Washington Mill Road Bridge once stood over the Little Miami River. Inside view of the Washington Mill Road Bridge. A Double Smith Truss is a frame that contains beams and braces arranged in a triangular shape. 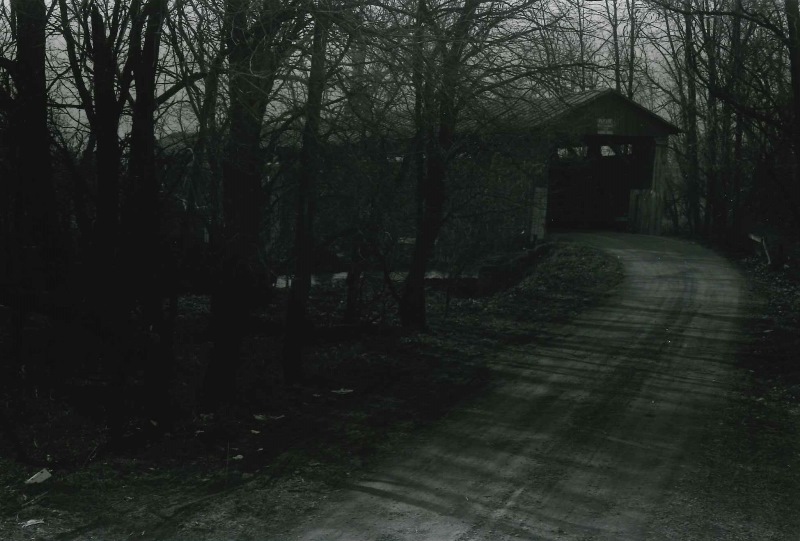 Photo from Covered Wooden Truss Bridges of Greene County, Ohio by James H. Shell, 1998. The Washington Mill Road Bridge was located in Sugarcreek Township and was constructed by the Smith Bridge Co. utilizing a Double Smith Truss. During the spring of 1964 arsonists targeted the bridge. Luckily, the fire was discovered just in time. Unfortunately four years later, the bridge was set on fire again and was completely destroyed. More than fifty wooden truss covered bridges served as passage ways for folks traveling over the numerous creeks and rivers that run through Greene County. The earliest known bridge was built in Caesars Creek Township during the years 1848 and 1849. This Spring Valley Bridge was constructed for the Cincinnati & Xenia Turnpike Company. The company erected a toll gate at the beginning of the bridge and in 1850, the Greene County Commissioners brought a lawsuit against the business. Let's find out why the Commissioners did this by looking at a March 1850 Commissioners Meeting Record. 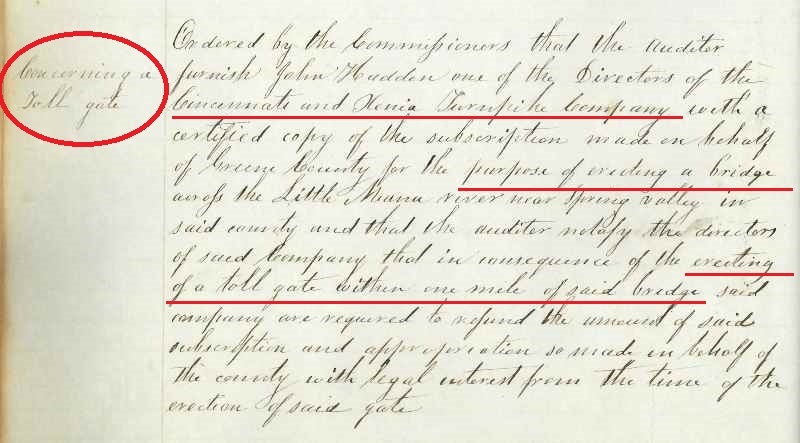 The Cincinnati & Xenia Turnpike Company erected the toll gate within one mile of the bridge and was required to refund the amount of subscription and appropriation of the bridge. Apparently, the Commissioners found fault with having a toll gate within one mile of entering the bridge. 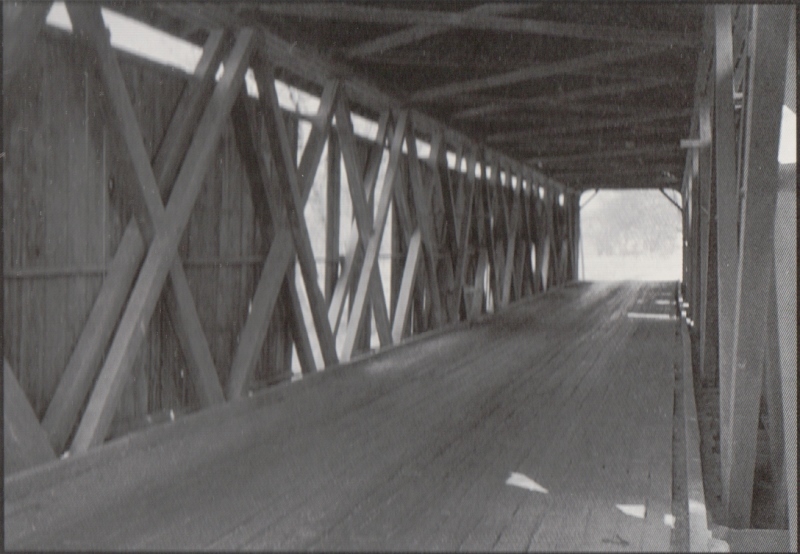 Wooden Truss Bridges were constructed all throughout the County up until the late 1880s. Many of these bridges have either been removed or destroyed. However, there are still four standing. Just recently, the Engle Mill Road Covered Bridge was restored in 2014 and was dedicated as a historical bridge by the Ohio History Connection. The bridge was built in 1877 and was constructed using a "Smith Truss." The Engle Mill Road Bridge, located in Caesars Creek Township, is thought to be one of the longest covered bridges remaining in the United States - the structure is 136 feet long. Covered bridges are beautiful structures and played an important part in Ohio's history. If you have a chance during this fall season, take a drive out to see the Engle Mill Road Bridge. To find the exact location of this structure check out our HistoryPin website. This Week's Trivia Question: Name another type of bridge truss. Last Week's Trivia Answer: Can you name the Greene County Archives Mascot? (Hint: Check out our Educator's Resource Webpage). - "Buckles The Beaver"
Sources: Shell, James H. Covered Wooden Truss Bridges of Greene County, Ohio. Xenia, OH: Greene County Historical Society, 1998.